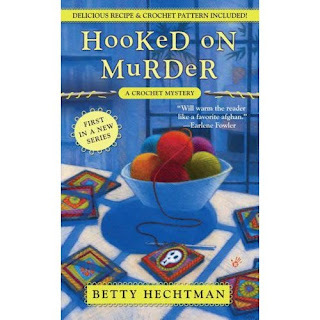 In Hooked on Murder by Betty Hechtman, Molly Pink stumbles upon (literally) the body of her neighbour Ellen Sheridan. When the police arrive and find Molly hovering over the deceased, things get complicated. Things get even more complicated when her past relationship with Ellen is revealed. Ellen was once the business partner of Molly's husband. When he died, Ellen pushed Molly out of the business. Although Molly has since gone on with her life, the police don't believe there are no hard feelings. Not to mention Detective Heather has it out for Molly. Ellen was the leader of the crochet group that meets at the book store where Molly works. To clear her name Molly takes up the hobby and joins the group in an attempt to find the real killer and clear her own name. "We may be the new kids on the block, since crochet isn't nearly as old as knitting, but we will not be treated like the poor stepsister anymore." Adele raised her fist in a sign of crochet power, and you could practically hear some kind of anthem start in the background. That rivalry is highlighted throughout the book. Although there was quite a bit about this book that I liked, I had high hopes for Detective Heather and was disappointed. The author makes her a two dimensional character out to steal the protagonist's man and put her in jail. And unless she has a dog named Scooby-Doo, I don't know how she could have been in charge of a homocide and miss such huge clues. That's my biggest gripe with the book. If you want a quick entertaining read, I recommend this book. I admire a woman who can crochet! I've tried and tried and never made more than a snake with scoliosis. :) There was a similar series of books about murders and detective work that revolve around a cross stitch and needlework shop. I can't remember much about those books right now, but they were fun for those interested in that hobby. This book reminds me a lot of that. I was on a huge mystery kick for about three or four years, but it sort of died a couple years ago. Now I have all these mysteries in my TBR bookcase, just waiting for another mystery kick to come along! Now off to browse your etsy shop! There are so many cozy hobby mysteries out there. Just finished SHOOTS TO KILL, a flower shop mystery. It was cute but not much oomph to it. And, your crochet items are lovely! One of my friends who visited me this weekend is learning crochet and she was showing me - looks hard! Literate- I think there's a knitting series too. They could have a series for every hobby. Dewey- I have to take them in small doses. Karen- A flower shop one too? I wonder what's next. Iliana- Thanks! A few here and there are a nice break. I wish we had a crotchet group around here, I would love to learn! Berkeley Prime Crime Mysteries are usually pretty good but I've come across my fair share of Detective Heather's there. I have to admit that I love the extras in the books (recipes, etc) though!